To Andrew Wheeler, the head of the Environmental Protection Agency, global warming is a problem for the future. "Most of the threats from climate change are 50 to 75 years out," he said in a recent interview, expressing a common sentiment. "The next decade is really critical," said Joeri Rogelj, a climate scientist at Imperial College London. That's not just because the impacts of rising temperatures—from severe storms to surging seas—are already apparent. It's also because limiting future damage requires bold moves to reduce carbon dioxide and other greenhouse gas emissions today. Think of it like steering a huge ship, said Drew Shindell, a climate scientist at Duke University: "You have to turn way in advance because it takes a long time." Under the 2015 Paris climate accord, countries agreed to limit warming to "well below" 2 degrees Celsius (about 3.6 degrees Fahrenheit) over preindustrial temperatures, and to aim for a goal of 1.5 degrees C (about 2.7 degrees F). Next week, scientists will gather in Scotland to consider the options as they start preparing the next major IPCC report. There's little debate that keeping warming to 1.5 degrees will require sweeping efforts to reduce greenhouse gas emissions in the next few years. It's a matter of accounting: Humans have already unleashed enough greenhouse gases to raise the planet's average temperature by about 1 degree C. At current rates, we will emit enough in the next 10 years to all but guarantee another half-degree of warming. Aiming for 2 degrees gives the world an additional 25 years, more or less, to decarbonize the economy, Rogelj said. Even so, the task will get much harder if society doesn't start curbing emissions before the decade is up. 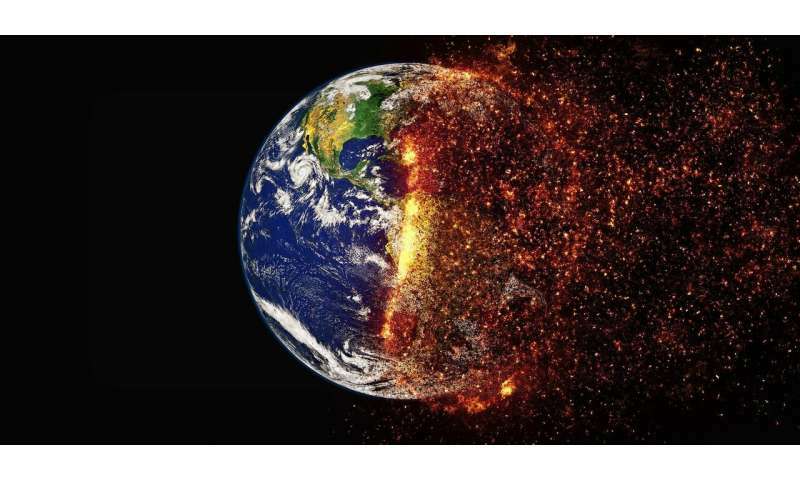 "If we already start to put the world on a declining path, with a clear trajectory towards net zero, that would be a huge achievement," he said. That's sometimes used as an excuse to delay, said Jonathan Lamontagne, a systems analyst at Tufts University. But he thinks it's a reason to mobilize sooner—in case the job turns out to be even harder than researchers expect. "That makes it so tricky," said Gabriele Hegerl, a climate scientist at the University of Edinburgh. The true value of climate sensitivity will largely determine how much warming we have in store due to greenhouse gases we've already emitted, and how much carbon we can emit in the future and still meet climate targets. If sensitivity lands on the high end of the range, we've probably missed our shot at limiting warming to even 2 degrees, according to a study this month in Nature Climate Change. "It might actually be too late," said Lamontagne, who led the study. Recent estimates of transient climate sensitivity point to somewhat lower numbers; if so, we have until midcentury to curtail emissions. But scientists say that's no reason to dally. "You still have to do a lot—and do it soon," Hegerl said. In the long run, the bigger factor controlling Earth's temperature is how much we manage to reduce emissions in the next decade, Lamontagne said. "Our actions today are going to lock future generations in to a climate that they'll have very little control over," he said. In these scenarios, the changes happen around the world—and fast. Many are well underway by 2030. Implementing them would be expensive, but theoretically feasible. The IPCC estimated that achieving a 1.5-degree world will require $2.4 trillion in clean energy investments every year until 2035. That's equivalent to 2.5 percent of the world's combined gross domestic product. Lamontagne's team calculated the price tag could be as high as 3 percent or 4 percent of global GDP to max out at 2 degrees of warming by 2100. Failing to act also carries a hefty cost. One study estimated that 4 degrees of warming would rob the world economy of $23 trillion per year; another found that by 2100, unmitigated climate change will reduce global incomes by 23 percent. The toll could reach hundreds of billions of dollars per year in the U.S. alone, according to a 2018 report commissioned by Congress. "The bills come as part of our medical insurance and home insurance and flood insurance," Shindell said. Whether society can change fast enough to meet the Paris climate goals is anyone's guess. Scientists can make estimates, but it's time to start experimenting in the real world, Rogelj said. "The only thing we know now is that we can try," he said. So far, countries' official pledges to reduce emissions under the Paris accord fall far short of what's needed to meet the 1.5-degree target. "It is getting a bit dangerous and sad to watch," Hegerl said. Proposals like the Green New Deal championed by Rep. Alexandria Ocasio-Cortez, D-N.Y., seek to dramatically accelerate emissions cuts in the U.S. over the next 10 years, although it's unclear if there is political will to embrace such a plan. In developing nations, steep economic and technical hurdles may make the task even harder. Another decade of inaction will likely mean blowing past current climate targets—unless we come up with ways to clean up the mess later. Alternatively, humans could alter the amount of sunlight reaching the surface by injecting reflective particles into the stratosphere. But it's a controversial idea, and it wouldn't address the health impacts of fossil fuel pollution or problems like ocean acidification. Caldeira points out that scientists have been calling for aggressive climate actions for decades. But he objects to the suggestion that this is our last chance to do something. It's not because there is plenty of time, he said, but because he doesn't agree that it's a make-or-break situation. "The more we delay, the harder we will need to work, and the worse outcomes will be," he said. But if we miss the Paris goals, "our brains are not going to explode." "Stopping sooner is always better than stopping later," he said. "But it is never too late to stop." When it comes to co2, less is better and none is best. The critical point was forty years ago. We had the chance to avoid AGCC then and the destroyatives got their way and promoted global warming as a "good thing." Now it's going to cost a lot more. The pre-industrial level is currently term best for nature and thus society. None is impossible and would kill most plants and animals anyway. "The pre-industrial level is currently term best for nature and thus society. None is impossible and would kill most plants and animals anyway." I meant none as in no emissions from humans. A little climate denial action. Is this suppose to be about there is no world wide warming? The NOAA was talking about a 12 month stretch in the United States. I put in july 2012 and NOAA talks about the 12 month record. 2012 in march was just a crushing record setting month. I'm wondering if this is the shiny object distraction from how bad AGW really is.